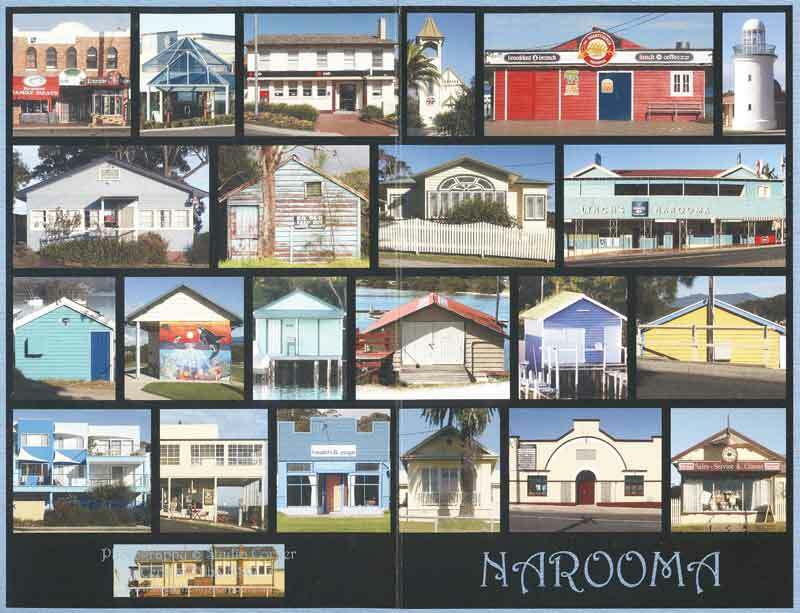 I don’t actually live in Narooma, but about six kilometres away. But Narooma is where I go to shop, visit the library, fuel up the car etc. A lot of buildings have a distinctive roof line which has now been decreed by the council as being the preferred design for new buildings. This postcard illustrates the style well. I would credit the photographer and link to his/her website if I could – but unfortunately, that info is printed in the bottom left hand side, over an image of the marine rescue station, and is completely unreadable…hmmm. UPDATE: I have since been advised that the photographer is Brett Thompson – http://brettthompson.com.au/historiccards.html. On my frequent bike rides around town I stop and photograph the many local signs for oysters, fish etc. I created a little boat shed from hand dyed fabric, and made a thermofax screen from one of the local signs. I have made several of these now and will load them up as I finish the quilting/facings. They are quite addictive and a good way to experiment with layouts and techniques – including my machine quilting which has never been my strong point, and which I am determined to improve. Practicing new stuff on a small scale makes it seem less challenging, don’t you think?